The Fellowes Saturn 3i 95 pouch laminator is a light volume pouch laminator ideal small office laminating needs. This pouch laminator can laminate documents up to 9-1/2'" in width allowing for lamination of legal and letter size documents utilizing laminating pouches up to 5mil in thickness. A light volume small office use pouch laminator that is ideal for those who are not frequent laminating users. This pouch laminator is covered by a Two Year Warranty. The Fellowes Saturn 3i 95 Laminator is perfect for occasional small office applications. It accommodates documents up to 9-1/2 wide and features advanced temperature controls for consistent lamination quality. With InstaHeat technology, the Saturn 3i is ready to laminate in one minute. 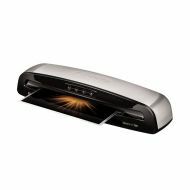 The Saturn 3i features a green light and audible beep signal when laminator is ready, a release lever disengages pouch for re-centering or removal and a slim, professional design suits any office décor. Includes laminating starter kit.